A rare total lunar eclipse occurs tonight and will be visible across the Americas beginning at about 11:00 pm and lasting until about 3:00 am MST/PDT in the United States. The Full Moon will be exact at 12:42 am MST/PDT at 25 degrees 16 minutes of the sign Libra. Here’s the chart: TotalLunarEclipseinLibra2014 This eclipse is the first of four total lunar eclipses in a row between now and October 2015 being referred to as a ‘tetrad’ or ‘group of four.’ Lunar eclipses occur regularly every five and half months. But this lunar eclipse begins a TOTAL lunar eclipse ‘tetrad’ which is a rare phenomenon since lunar eclipses are not always total – where the Moon passes precisely (not a little above or a little below) the exact alignment of the Earth and Sun resulting in a complete or total blockage of the Sun’s light upon the Moon’s surface. 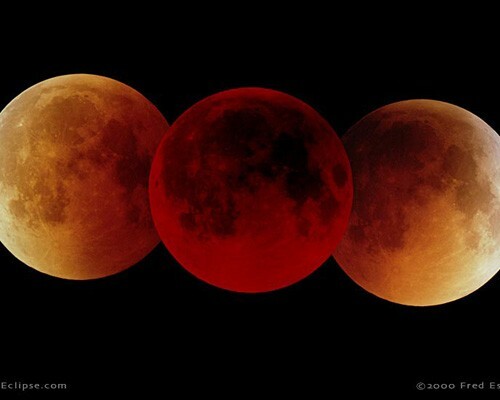 Additionally, what makes this tetrad rare is the fact that total eclipses of the Moon don’t often happen successively, let alone four in a row. This lunar eclipse is further distinguished by Pluto stationing (standing still or ‘stationary’) to turn retrograde today just eight hours before the eclipse at 4:44 pm MST/PDT. AND since the eclipse occurs across the Aries/Libra axis its also energizing the once-in-a-lifetime Grand Cardinal Cross that will reach precision for the second of three times in just a week from April 20th to the 23rd (first time was December 25-30, 2013 and the third will be June 14-25, 2014). Finally, the fifth of seven ongoing exact square aspects (90 degree angle) between Uranus in Aries and Pluto in Capricorn will happen next week on April 21st. That’s a WHOLE LOT of celestial energy! Astrology always reflects reality through the hermetic principle of “As above, so below.” Coincidentally, there’s also a WHOLE LOT going on in our world right now! The primary influence of this Libra lunar eclipse is a culmination of old relationship patterns and behaviors that are no longer working. Libra is the sign associated with learning how to be in relationships as equals which helps us to achieve and maintain balance. But Libra is also the sign of extremes! It’s LEARNING balance. The polarized state of our national and global politics, cultural norms, religious beliefs and economic ‘realities’ are extraordinary examples of current EXTREMES! We’re at a cross-roads needing to make new choices about how we treat one another and how we treat our planetary home — the natural world that sustains us. Clearly the path we’re on has reached the limits of sustainability. Other celestial bodies in Libra affecting the lunar eclipse pattern are informative. They include Mars (the God of War), the dwarf planet Ceres and the asteroids Juno and Vesta. Ceres, Juno and Vesta are all heavenly bodies that represent feminine archetypes associated with unconditional love, nurturing/nourishment, partnership commitments, fidelity and passionate spiritual devotion. For thousands of years patriarchal conditioning has suppressed and marginalized women resulting in extreme imbalances in our relationship with half of the planet’s population, with our stewardship of the environment and in our disconnection to ‘Gaia’ the quintessential feminine consciousness of our planet Earth. Needless to say, humanity’s habitual war-like tendencies clearly also contribute to relationship imbalances! While some are still calling for military responses to current global events (can you say Ukraine, Syria, Iran and North Korea??? ), its time to respond differently if efforts are to succeed. The Grand Cardinal Cross is a planetary configuration comprised of four planets, each in a cardinal sign (Aries, Cancer, Libra and Capricorn) that are square one another (90 degrees) and opposite each other (180 degrees). Squares and oppositions are tense angular relationships whose energies are often conflicted or challenging. Squares reflect important choice points. These choices have to do with deciding what actions to take or whom or what to believe. Oppositions bring issues to a head forcing either a completion or separation of existing circumstances. Its important to understand that cardinal energy typically manifests through a dance of two steps forward, then one step back. This is because cardinal energy instinctively initiates actions that move us in new directions. But new experiences are often stressful because they take us into unfamiliar territory which can be frightening. We take a step back to regroup and re-establish security when that security has been upset by moving forward in new ways. Ultimately, through feedback received after taking those initial steps, we’re able to decide which new directions we are meant to continue moving towards. Uranus in Aries square Pluto in Capricorn has been THE planetary ‘base note’ anchoring the Grand Cardinal Cross. This astrological influence began in 2008 with Pluto’s entrance into Capricorn for sixteen years. Remember 2008 was when the global economy began to dramatically contract. In 2010, Uranus entered Aries and began forming its square angle/aspect to Pluto. It first entered Aries in May and stayed until August when it went retrograde moving back into Pisces over the fall and winter of that year. It returned to Aries for a stay of seven years on March 11, 2011 within hours of the 9.0 earthquake off the coast of Japan that was followed by the enormous tsunami that crippled the Fukushima Diachi nuclear power plants that are still damaged and leaking radiation to this day. These extraordinary events are associated with two of the most powerful elements of our current global social structural paradigm (Capricorn): how we generate power and how we operate our global market driven economies. Both have and will continue to need radical reforms if they are to be sustained in the future. Jupiter has been in Cancer since June 2013. It has been reflecting our increased emotionality and growing insecurities both personally and collectively as the world around us continues to change in dramatic and sometimes unexpected ways. One of the most important choices we all face right now is whether to embrace these changes with optimism and excitement or dread and fear. Choose to move forward anyway even in the face of fear! Holding on to the past will only bring pain and confusion. Evolutionary changes are necessary now. Resistance will only ensure an increased likelihood that these changes will ultimately be forced upon us. Mars entered Libra in December 2013. Typically it takes only two months to traverse a sign. Its current retrograde cycle (March 1 to May 19, 2014) will prolong its sojourn in Libra for eight months ending in August this year. Mars rules Aries, the sign opposite Libra. Mars rules war but is currently in the sign of peace! Interestingly, when planets are retrograde, their energy naturally gravitates towards the opposite sign to facilitate its own evolution. Aries/Libra is the relationship axis of the zodiac. These two signs represent self (Aries) and our relationship with others (Libra). These two signs are always trying to find the right balance between independence/freedom and commitment to others. Intuition is the guiding force necessary to achieve this balance. When we’ve spent too much time alone, our intuition will let us know and prompt us to connect with others and be more social. On the other hand, when we’ve been hanging out with others and socializing so much that we’ve lost track of our own individuality, then our intuition will alert us to the need to spend some time alone so we can reconnect with our own needs and wants. Be mindful of your intuitive urges in the coming days and weeks to find the right balance between yourself and others. The bottom line of all this energy is this: WE ARE LIVING IN EXTRAORDINARY TIMES! Ancient cultures the world over have shared their prophecies about this being a time where humanity will experience a quantum leap forward in consciousness towards a much greater understanding of the truth of our experiences and our reality. Perhaps the most exciting breakthrough of our times is the discovery by quantum physicists that human consciousness affects what reality is experienced or manifested. Put simply, we now know that consciousness creates reality. We are indeed CO-CREATORS. We create our reality in every moment through the uniquely human capacity of free will choices. The trick is to choose CONSCIOUSLY instead of unconsciously. This requires that we pay attention to what we’re thinking, feeling, believing and doing. The Libra Lunar Eclipse is a harbinger of great change. The heavenly patterns are reflecting important choices we now need to make in order to evolve and grow. Its time to let go of what’s no longer working. Its time to choose different ways of being and doing. We have the power to change our world, solve our problems, heal the planet and restore peace and balance in all our relations. Its time to choose anew. What will you choose? This entry was posted in Planetary Events and tagged choices, consciousness, emotional security, equality, evolution, extremes, free will choices, Full Moon, Grand Cardinal Cross, imbalance, Jupiter, Libra, Mars, patriarchy, peace, Pluto, quantum science, reality, reforms, relationships, revolution, Total Lunar Eclipse, Uranus, war. Bookmark the permalink. Thank you soon much for this, Donna. I have such gratitude and respect for your work. You are a gift to/for us all.